To assist with his job search Kevin worked with Dirkse Counseling and Consulting, Inc. Employment Specialist Chris Perry. Chris helped connect Kevin to the opportunity at the Home Depot and now checks in with him on a regular basis to provide support or job coaching if needed. Dirkse CC is a local agency contracted with The State of Oregon, Department of Vocational Rehabilitation to assist individuals with disabilities with their employment goals. They seek out partnerships with employers in the community such as The Home Depot, who are diverse and inclusive and who can appreciate the skills and abilities of the individual. Their goal is to help insure a good match between the job seeker and the employer and that there is long-term success and support for both. 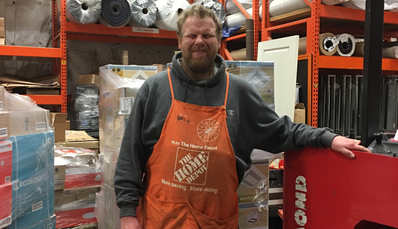 Thanks to the partnership between The State of Oregon, Dirkse CC and employers like The Home Depot, Kevin reports that he is now in his “favorite job”. On your next trip to pick up plants, hardware or holiday decorations, you may find Kevin hard at work, with a willing attitude and smile on his face, helping customers or fellow teammates. We have enjoyed our relationship with Dirkse tremendously. They are incredibly organized and do a fantastic job at communicating at every level.